DESCRIPTION: This in-water Yoga class focuses on holding a sequence of standing poses which flow from one to the next. Holds, transitions, flow & breathing principles are based upon techniques borrowed from Bikram Yoga and are modified to be done in water. This mind/body connection should improve balance, core strength, flexibility and envelop you in a total feeling of relaxation. 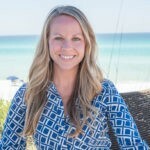 Sarah Brazwell is the sales and marketing director for Santa Rosa Golf & Beach Club. Reach her directly at sarah@santarosaclub.com.